To Place Our Deeds traces the development of the African American community in Richmond, California, a city on the San Francisco Bay. This readable, extremely well-researched social history, based on numerous oral histories, newspapers, and archival collections, is the first to examine the historical development of one black working-class community over a fifty-year period. 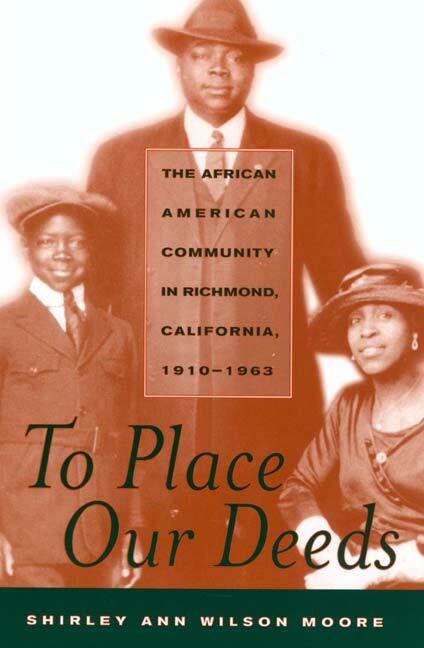 Offering a gritty and engaging view of daily life in Richmond, Shirley Ann Wilson Moore examines the process and effect of migration, the rise of a black urban industrial workforce, and the dynamics of community development. She describes the culture that migrants brought with them—including music, food, religion, and sports—and shows how these traditions were adapted to new circumstances. Working-class African Americans in Richmond used their cultural venues—especially the city's legendary blues clubs—as staging grounds from which to challenge the racial status quo, with a steadfast determination not to be "Jim Crowed" in the Golden State. As this important work shows, working-class African Americans often stood at the forefront of the struggle for equality and were linked to larger political, social, and cultural currents that transformed the nation in the postwar period. Shirley Ann Wilson Moore is Professor of History at California State University, Sacramento.